Boneface Shake Your Blood. A red IPA. This one a gift from the brewer, on whom I threw my pitiful self, and they took me up and fit me up with their new beer. I love free beer 🙂 I did say that I’d be honest with it. Lets be honest, Red IPA!!! Who doesn’t like a Red IPA. This is a brilliantly presented 500ml bottle of a beer that is 7.5% ABV, that’s 225 calories a serve size, and thats’ about 3 standard drinking units in NZ. Lovely foil work on that label. Shake Your Blood is a bloody big hoppy red IPA. It sings songs of caramel, toffee, fruity citrus, and finishes with bitter but delicious notes. A beer inspired by rock legends, it’s bound to break your heart as soon as it’s gone. Aroma is, of course, a familiar hoppy thing, deep dank, lovely. Pours like the colour of a nice port, red caramel brown and is dark like dark place, with a surprising head of just nearly white that is full, firm and in fine form. Aroma is lovely in the glass, but I am so in awe of the way that this beer looks, it’s pretty pretty. Deep redolent red. Bitter bitterness, with a belting middle cushion and lingering green hop note. It is so full of malt that is almost struggling with itself, but there is a lot going on in this, a competition for top dog. What a fight! As it warms it kicks even harder on the caramel in this, and it handles it well. The pdubyah-o-meter rates this as 9 of its things from the thing. A right belter of a beer this, full of itself and proud. Alarmingly pretty and not holding back on the malts, caramel, hops and it is all pretty much in check and behaved. But not a beer to be messed with because it’s serious stuff, and with this highly drinkable matched with the higher ABV will lead you astray like a pop-star groupie. Like I’d know about that. 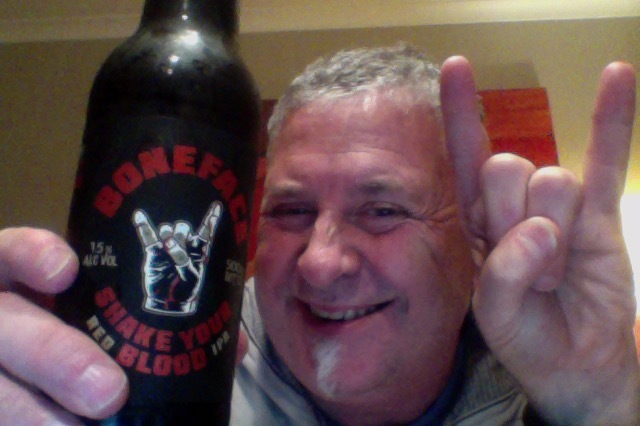 A Properly good bit of beer, beware…. Where did I get it? A gift from the Brewer themself. But I’m sure this will be in the good places. Am I enjoying it? Yes, this is standout nice, taste and looks. Would I have another? I would and I’ll be telling other to get one too. Would I share with a friend on a porch and set the world to rights? Yes, it’s not often you get a beer that has a whole package of things that should appeal, this has most of them, a beer to take seriously and not mess with. Portugal. The Man is an American rock band from Wasilla, Alaska. Have to say that this album is fairly rocking it. 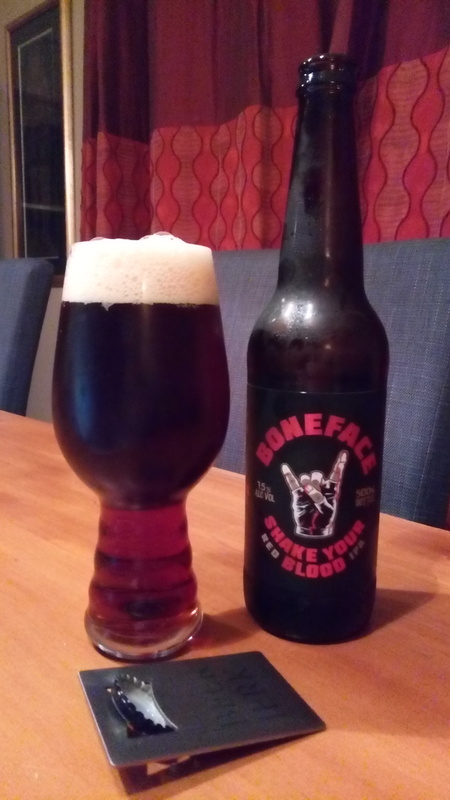 This entry was posted on June 17, 2017 by Philip Walter in Beer, Beer of New Zealand, Beer Review, BoneFace, Brewed By, Craft Beer, Critic, India Pale Ale (IPA) and tagged Boneface brewing, Boneface Shake Your Blood, craft beer, craft beer review, Shake Your Blood, Wellington.